Mark the Calendar Girls... NEW seasonal events AVAILABLE NOW. | iiaa Ltd | The UK and Ireland distributor of Environ Skincare, jane iredale makeup and Advanced Nutrition Programme. Mark the Calendar Girls... NEW seasonal events AVAILABLE NOW. Our Mastering Minerals make-up events have a fresh, seasonal focus in 2017. The Spring events run from March-May, Summer from June-August and Autumn/Winter from September-December. 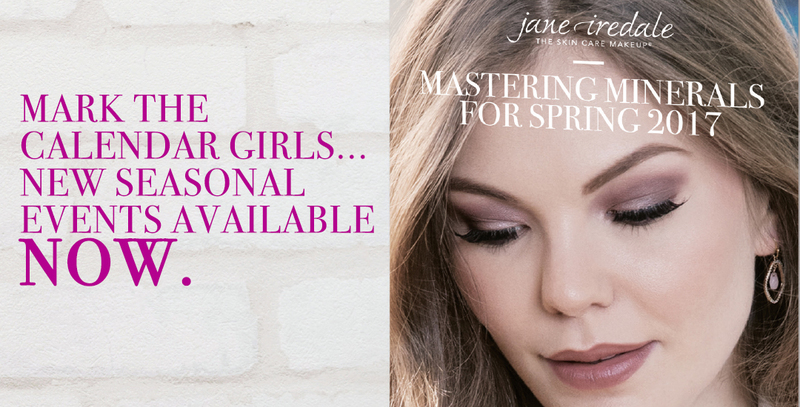 Mastering Minerals events provide a jane iredale make-up artist to your salon to deliver complimentary makeovers for clients to create stunning looks with the new season’s make-up range. This hands-on approach is a highly successful way of boosting sales, showcasing product ranges and introducing new customers to the brand. Clients should be pre-booked for all three seasons to have exclusive introductions to the new products and make-up trends. A loyalty card system will encourage repeat business with a free gift incentive to attend all three events. Call us today to book your Mastering Minerals events.